Three student groups cohosted the first Asian and Asian American mental health conference on campus from Thursday to Saturday. The conference, titled Break the Silence, aimed to foster understanding about the intersection between cultural identity and mental health, according to the organizers. The conference’s website cites Asians and Asian Americans as about three times less likely to seek out help for mental health issues than white people due to particular familial and cultural values, a lack of awareness of resources, and the “model minority” stereotype where identity is tied to the notion of success. The three-day conference was a collaborative effort between the Taiwanese American Student Association (TASA), Active Minds, and PanAsia Solidarity Coalition, and included panels, breakout sessions, and workshops. According to TASA president and third-year Emily Shen, the idea for Break the Silence originated during fall quarter in a meeting between leaders from an RSO cohort, of which PanAsia was also a member. Shen said that she and other leaders recognized a need for mental health conversations for Asians and Asian Americans that included professional expertise. Shen said she was inspired to explore mental health when YouTuber Anna Akana spoke at a TASA event on campus last year about experiencing grief following her sister’s suicide. The conference’s name, “Break the Silence,” draws from a perceived lack of open and authentic discussion of mental health in Asian and Asian American households. 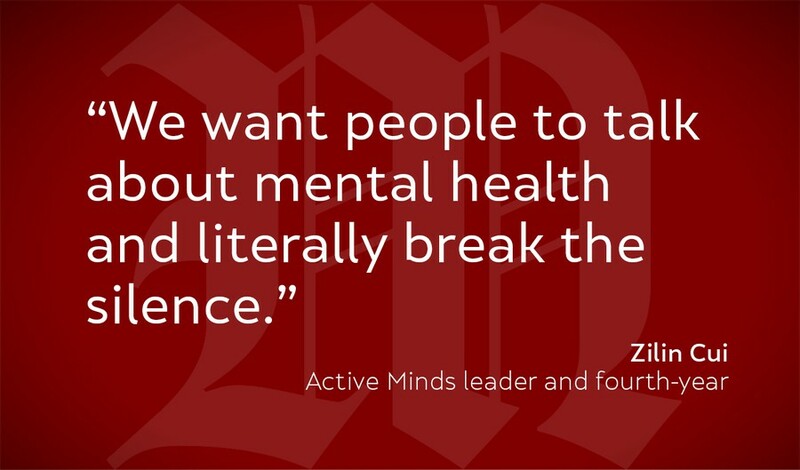 “We want people to talk about mental health and literally break the silence,” said Active Minds leader and fourth-year Zilin Cui. The first day of the conference featured a screening of the documentary *Looking for Luke*, which depicts how the friends and family of Harvard second-year Luke Tang grappled with his suicide in 2015. The documentary largely follows Tang’s parents as they confront previously overlooked signs of their son’s struggle with depression, and their mission to educate others about the severity of mental illnesses. Following the screening, a panel of University professors and researchers, including Miwa Yasui, Yoonsun Choi, Seeba Anam, and Sarah Taylor, discussed the documentary and the complexities of addressing and seeking treatment for mental health in Asian communities. Break the Silence’s second day featured a variety of mental health breakout sessions. Participants chose among panels specific to different communities such as Asian international students, religious groups, and LGBTQ communities, or interests such as managing distress and seeking support from friends and family. A mental health crisis workshop, “Alternatives to Calling Police in Mental Health Crises,” was held on the last day to teach people about de-escalation techniques and other alternative solutions to dialing 911 when responding to mental health emergencies. The workshop also discussed how mental health crises affect police treatment and provided opportunities for participants to engage in mock crisis interventions. Plans are underway to turn Break the Silence into an RSO and eventually to host additional sessions throughout the school year, Shen said, adding that an information session will be held later this quarter for people who want to become involved.